Rosie’s first parcel from Little Passports arrived this week. It was greeted with much excitement & fervour, opened immediately, and the activities completed within the hour! 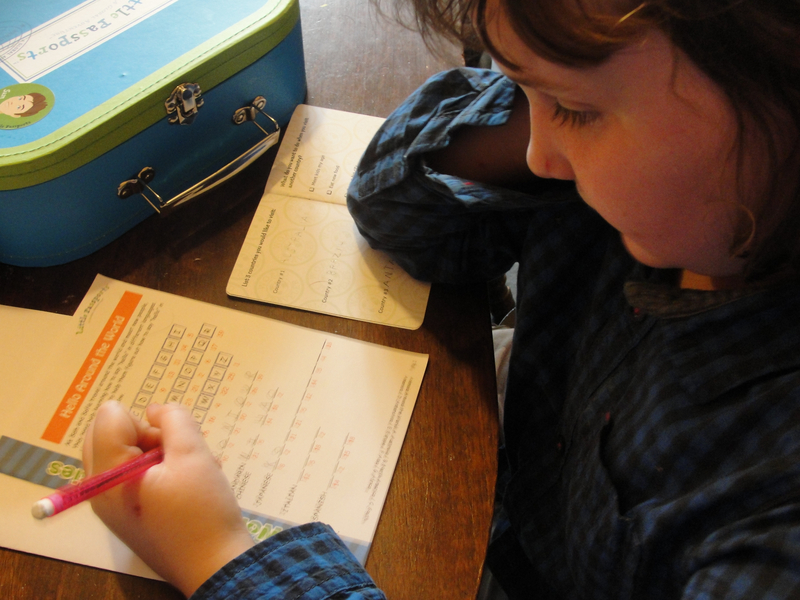 The initial package contains a letter from Sam & Sofia; the imaginary children that are writing to your child from various destinations around the globe, a passport, boarding pass, stickers, wall map, activity sheets and finally a Little Passports suitcase. This is designed for the child to keep all of the items sent in future packages. It is sturdy & well made & Rose was soooooo excited to have one! She first added the stickers of Sam & Sofia to her suitcase, then completed her passport, filling in her name & address, plus the other couple of questions in there which really engaged her. Next she chose to play the activities online. The ‘boarding pass’ the child receives has a special code, which allows them to access various online games, puzzles, quizzes, and other activities. Rose whizzed through these, playing them all, then she wanted to complete the activity sheets, which she had fun with. One of the games on the activity sheets lets your child know which country Sam & Sofia will be visiting next. Oooh! The excitement! I am really delighted with Little Passports. Rose whizzed through this first package, but she is able to go back & play all the online activities at any time. I think the main benefits for me are the following; I was looking for an activity for Rose that she could work on at her own pace & have me as involved or uninvolved as she liked. The first package is of really high quality and & I pleased that this structured activity will be dropping through my door once a month. If The World Were A Village: A fantastic, thought provoking book, which explains facts about the world’s population in a simple and fascinating way. Material World:This book shows ‘average’ families from various countries, photographed with all their possessions. Hungry Planet: What The World Eats: Again, a book filled with informative photographs, revealing what people eat during the course of one week. I will also be taking books out from our local library each month, to read about the individual countries, and I plan for Rose & I to create some national dishes from the various countries. I hope this gives a little insight into what is included with Little Passports. Here is a link that gives more information about the various packages.